The latest figures from the British Embassy in Madrid suggest that are as many as 800,000 British expats living in Spain for all or part of the year. Of these 75,000 are retired and have moved there permanently. If you are a UK pension policyholder and have settled, or intend to settle, in Spain, you should consider transferring to a QROPS (Qualifying Recognised Overseas Pension Scheme). 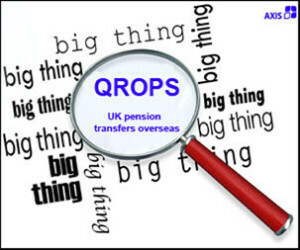 QROPS are pension vehicles that are approved by HM Revenue & Customs (HMRC) to facilitate the transfer of UK pensions overseas. A list of recognised schemes can be found on the HMRC website. Protection of assets from creditors and divorce (It is harder for UK courts to take action to seize or lay claim to funds contained in a QROPS than in the case of a normal UK pension). Where a policyholder has been a non-UK resident for less than five full UK tax years, the QROPS provider must report to HMRC all payments made to the policyholder. Where a policyholder has been a non-UK resident for less than five full and consecutive tax years, the QROPS provider must report to HMRC all pension payment distributions. In the meantime the QROPS is treated as if it is still a UK pension scheme by HMRC. The QROPS provider is obliged to report all pension distributions to the Spanish tax authorities (Hacienda) for the first ten year period of non-UK residency. If a death payment is made within the five year reporting period, the QROPS trustees is obliged to report the payment to HMRC in respect of the deceased member. After five complete years of non UK residency 100% of the remaining fund should be available to beneficiaries free of UK tax. If an individual dies below the age of 75 within 5 full and consecutive years of becoming non-UK resident, the deceased’s pension will be treated under UK law. The previous tax charge of up to 55% on inherited pensions was replaced in 2015 by HMRC. The individual will now be able to pass on their remaining ‘defined contribution’ pension to beneficiaries as a lump sum free of UK tax, whether it is in a drawdown account or untouched as long as it is paid out in lump sums or is taken through a flexi access drawdown account. However, if the individual dies within 5 full and consecutive years of becoming non-UK resident, whilst 75 years of age or over, under UK law beneficiaries would be taxed at their marginal rate on any draw down from the pension. Beneficiaries currently have the option of also receiving the pension as a lump sum payment, subject to a tax charge of 45%. There are plans to make lump-sum payments subject to tax at the marginal rate for the 2016-17 tax year. The current lifetime allowance for Pension funds had been set at £1.25 million, reducing to £1 million as of April 2016. Any amount transferred to a QROPS above £1 million would be taxed in the UK at the marginal rate of income tax. Spanish residents are required to report income drawn from a QROPS on their annual tax return. However, by declaring the pension income as an annuity in Spain, it is possible to benefit from favourable tax treatment. To this end the QROPS trustees supply Spanish tax residents with a certificate confirming that the income distributed from the pension fund is a “temporary annuity”. When personal allowances are taken into consideration, the treatment of the pension income as a temporary annuity invariably becomes an attractive proposition for a Spanish tax resident. If you receive your pension lump sum whilst resident in Spain, it will be taxable in Spain. For further information on how the proceeds of QROPS are taxed please visit our page on Taxation in Spain. Once a decision has been made to transfer your UK pension to a QROPS the next thing to consider is which jurisdiction your scheme should be located in. Unfortunately Spanish law does not recognise trusts; however such structures are preferred in order to receive/protect UK pension transfers. It is important therefore to look for alternatives. The most popular choice in terms of jurisdiction for those living in Spain is Malta. These factors help to simplify the process when it comes to the transfer of UK pensions and the taxation of pension income. When an individual buys a QROPS it is regarded as a Malta pension, not a Malta trust. The trust is an administration vehicle and is used as a way of protecting the policyholders rights. The duties of the trustees are thus important in terms of how they look after an individual’s affairs/invest money. It should be noted that in the case of a Malta QROPS, pension income should be declared in Spain for those tax resident there.